Clement Ambrose Ducy was the youngest of four children born to Cornelius L. Ducy, Sr. and his wife, Emily Ann Boylan. The family lived in Pueblo, Colorado. Ducy attended public school in Pueblo until entering Catholic University on a music scholarship (He played the piano, organ, drums, violin, and sang basso profundo) in 1929, graduating with an A.B. in Economics in 1933. Ducy was the first member of his family to attend a four-year university. Ducy and a fellow student, Michael McDonald '31, worked together to write the Catholic University Marching Song-- McDonald wrote the music and Ducy the lyrics of what proved to an enormously popular song among students, eventually becoming so well-liked that it was known to a national audience. 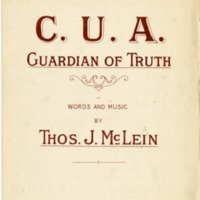 Shortly after the song was introduced in a performance by the Glee Club, (McDonald played the piano and Clement Ducy performed with a double quartet of singers) the school newspaper, The Tower, wrote an editorial about the importance of the song, noting that in 1930 the football team had struggled so the school needed a rallying cry to get the student body out and supporting the team again. In an effort to build spirit, The Tower printed the words and encouraged the students to learn the marching song and some other school songs in order to show student spirit and team support. The Marching Song was well-loved by the students became well enough known that it was performed by Fred Waring and his Pennsylvanians on the "Old Gold Hour" where Waring was performing a program consisting of the most popular collegiate songs of the day. The "Old Gold Hour" was heard on the Columbia Broadcasting System and was carried by stations across the nation. This was just one of Ducy’s many activities during college. In addition to performing with the glee club, he was active in the drama club, the debating society, the economics club, and the school newspaper. Senior year he also served on the commencement committee. And was admitted to membership in Pi Gamma Mu, national honorary social science fraternity in recognition of the scholastic work he did in the field of economics while in school. Before attending Catholic University, as a youngster he was cook's flunky on a railroad construction gang (and learned NOT to gamble!) Ducy held several jobs while in high school, most notably several positions with the Palm-Rialto Theatre Company; Ducy started out as usher, moved up to doorman and eventually was assistant manager. During his college years, Ducy went west to find summer jobs. During the summer of 1929 and 1930 he worked at farm jobs in the wheat sections of Texas, Oklahoma, Kansas, Nebraska, the Dakotas and in Canada. These jobs varied from plowing and working in grain elevators to driving trucks, tractors, and operating combines and threshing machines. During the summer of 1932 he returned to his hometown where he assisted his brother, Damian Patrick Ducy, who at the time was secretary-treasurer and general manager of a financial services company, Steel City Investment Company in Pueblo. While working for his brother, Clement gained hands on experience with real estate mortgage practices, bonds, finance, and credit terms as well as all types of insurance. 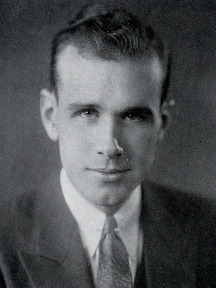 Following graduation (from 1933-35) he worked as a staff member for U.S. Senator Alva B. Adams (Dem., Colo.) and was then hired as a tax and economic consultant for the Public Works Administration in Pueblo from 1935-40. In 1939 he married Ellen Catherine O'Brien (Trinity College '34). They lived in Pueblo, Trinidad and Denver, then Cheyenne, Wyoming where he was with United Airlines. In 1943, (fearing he would be drafted, despite his flat feet in the specially made size 13 and a half shoes!) he took his young family to New York, and worked with the Sun Oil Company, (Sunoco), They moved in 1949 to Washington, D.C., where he held several private and public employments as an economist. These included the National Production Authority and as director of the materials division of the Small Business Defense Plants Administration and later the Small Business Administration. Ducy was a consultant in industrial economics, specializing in the fields of manufacturing, construction, petroleum, utilities, transportation, and taxation. He also served on various governmental committees, including National Production Policy Committee and the Strategic Stockpile Committee, as well as the Requirements and Allocations Board and the Review and Appeals Board. He also worked for the Federal Aviation Board on a mission to the Philippines. In 1968 he became an economist at the Federal Reserve Board, specializing in the emerging field of bank holding companies He retired in 1973. Throughout his life, Ducy took an active interest in various forms of energy, with a particular focus on research for solar energy. He held two patents for inventions in this area. In addition to a full professional life, Ducy took on other responsibilities. He was active with the Catholic Youth Organizations, eventually serving as president. He was also the founder and chairman of the CYO's trust foundation as well as a member of the Cardinal’s Committee for the Laity. Ducy was very involved in politics from his college years on and was a lifelong Democrat. He cofounded the National Young Democratic Clubs of America and was active in the election of 1932. Clement Ducy and Ellen O'Brien Ducy had three daughters, Ellen Catherine (1940), Mary Elizabeth (1943) and Patricia Cornelia (1945), all still living, respectively, in Santo Domingo, Dominican Repùblic, Houston, Texas and St. Augustine, Florida. Ellen married civil engineer and actuary, Hernando Pérez M; they have three children, (Clement's grandchildren): Ellen Catherine (1964), Thomas Hernan (1966) and Victoria Esther Pérez-Ducy (1982). Ellenita has three children (who are Clement's great-grandchildren): Catherine (1988, Felipe José (1990) and Camille Helene, 1997, while Thomas and Pilar Souto Pérez gave him two more great grandchildren: Diana Isabel (2003) and Daniel Andrés (2004). If Victoria marries, perhaps Clement A. Ducy will have more direct descendents! N.B. Eric Damian and Kate Kelly are the grandchildren of Clement's brother, Damian Patrick Ducy and the children of Patsy Ducy Kelly who is also still living, in Pueblo, Colorado.